QuébecDC40 – An anniversary worth celebrating! 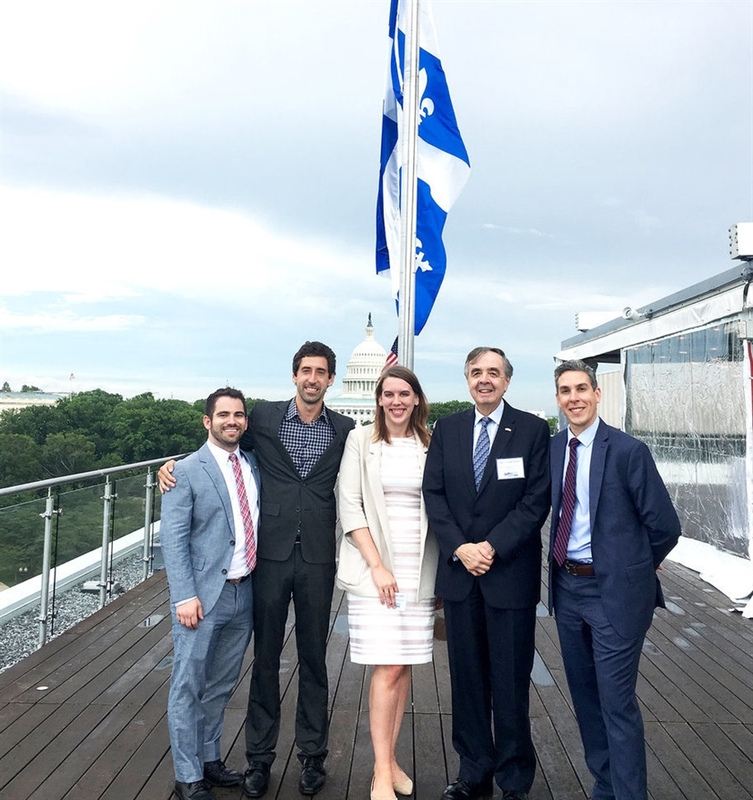 For the four staff members and interns at the Government of Québec's Office in the heart of Washington, D.C., last year was bustling to say the least. But 2018 was also an opportunity to celebrate 40 years of Québec diplomacy in the American capital. A look back on an action-filled year! On Capitol Hill, Québec Premier Philippe Couillard talks with Assistant Deputy Minister, Éric Marquis, Québec's former Delegate General in New York, Jean-Claude Lauzon, and the director of the Québec Government Office in Washington, Frédéric Tremblay. 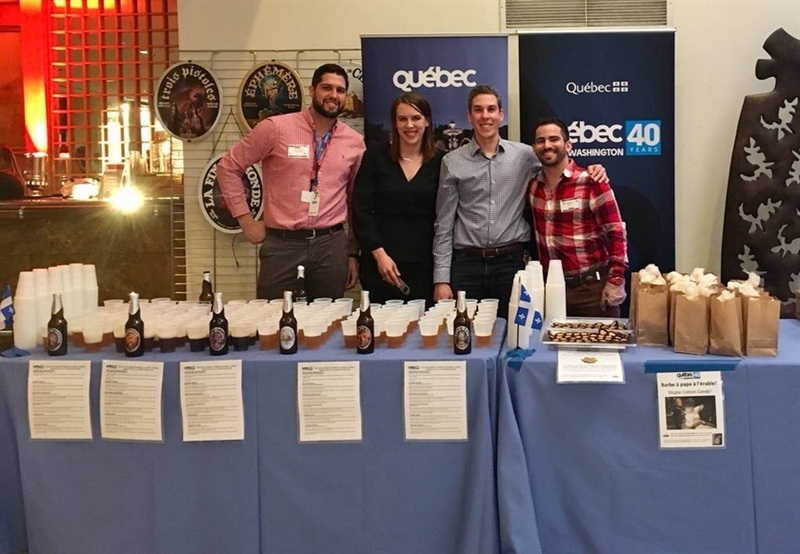 The BQW serving Unibroue beers, maple treats, and maple cotton candy at the Grande Fête de la Francophonie. From left to right: Alexandre Villeneuve, Kirsten Kazlauskas, Frédéric Tremblay, and Justin Margolis. 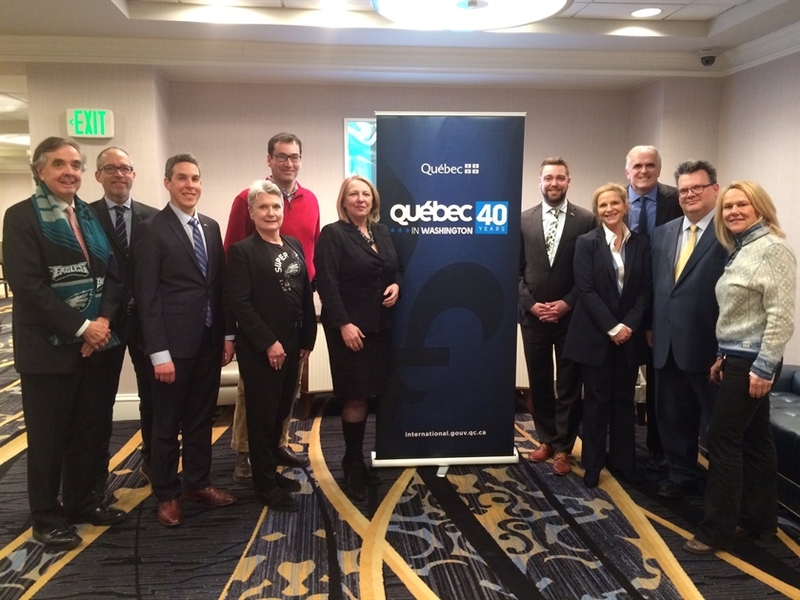 Strategic Meeting of Québec's Heads of Mission in the United States. From left to right: Jean-Claude Lauzon (New York), Donald Leblanc (Atlanta), Frédéric Tremblay (Washington), Andrea Townrow (Philadelphia), former Deputy Minister Jean-Stéphane Bernard, former Minister of International Relations Christine St-Pierre, Jean-François Hould (Chicago), Marie-Claude Francoeur (Boston), U.S. Division Director Jean-Pierre Forgues, Assistant Deputy Minister Éric Marquis, and Elizabeth Mackay (Los Angeles). Reaffirming the mutually beneficial nature of the Québec-U.S. relationship remains at the heart of our government relations activities, with a particular focus on trade policy. Our office actively engaged with business, academic, and community stakeholders while negotiators from Canada, Mexico and the United States worked to modernize North American economic integration. In collaboration with Québec’s other eight offices across the United States, we worked to defend Québec companies and industries against unjust tariffs and punitive duties imposed on their products including aluminum, steel, commercial aircraft, softwood lumber and newsprint. In that respect, Québec Premier Philippe Couillard made two official visits to Washington in 2018, where he met with high-ranking public officials including the Secretary of Commerce, the Secretary of Agriculture, several Senators and Members of Congress, as well as numerous Governors, notably at the National Governors Association’s Winter Meeting. These opportunities allowed our elected officials to directly engage with their American counterparts, and constructively address shared priorities and concerns. We look forward to welcoming members of Québec’s newly elected government to Washington in 2019. The BQW’s work extends far beyond government relations. With over 9 million residents, the Baltimore-Washington metro area is an attractive market for Québec companies. 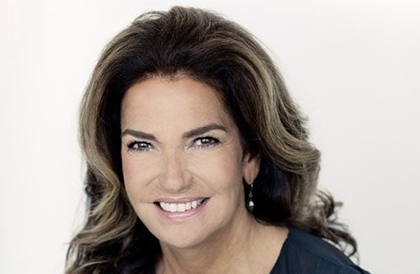 Our 2018 commercial initiatives were very popular, just ask the 100 participants at our Circular Economy Conference featuring Québec companies Enerkem and Solucycle, the 60 participants at our lecture on international financial institutions in Québec City, the Toyota manufacturing plant in West Virginia we visited with Québécois clean-tech companies, or the 14 Québec companies that participated on a mission to the World Bank. We were also present for the inaugural non-stop flight from Baltimore/Washington International Airport to Montréal-Trudeau, already one of Air Canada’s most popular cross-border routes. Now all three DMV airports have daily direct service to Montréal! Impossible to promote La Belle Province without culture! Our sponsorship of the Washington Revels allowed over 10,000 Washingtonians to experience the joy of wintertime in Québec. At the Alliance française’s Poetry Night, we paid tribute to two of Québec’s literary giants: Réjean Ducharme and Leonard Cohen. 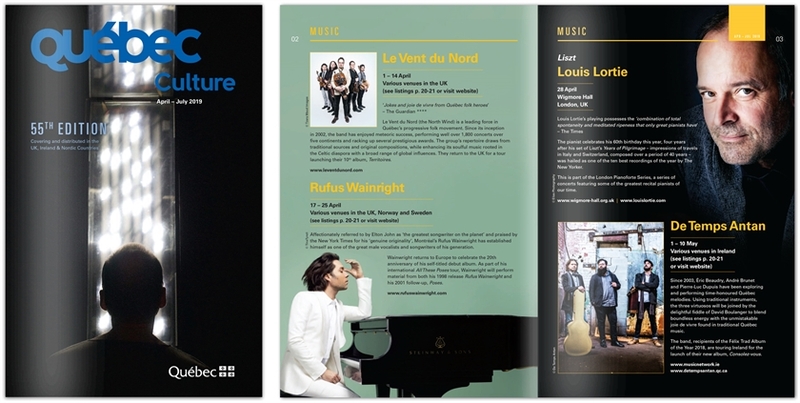 Add to that the ten Québec films that were presented over the year, including at the DC International Film Festival, concerts by Marc-André Hamelin, Yannick Nézet-Séguin, and Les Violons du Roy, two Cirque du Soleil shows, illuminated public art at Loop DC and Georgetown GLOW, a display of paintings by Québec artist Renée duRocher inspired by the works of novelist Kim Thúy, and our official sponsorship of Rafael Lozano-Hemmer’s exhibit Pulse, on display until April 28th at the Smithsonian Hirshhorn Museum. At our Fête nationale reception, several partners highlighted our four decades in Washington with this video-montage, one of several QuébecDC40 tributes available on YouTube. Certainly not least, we shared Québec’s culture with over 1000 students at schools and universities across the DMV, including our adopted school for 2018-19, School-Within-School @ Goding. As our anniversary year comes to a close, we thank you for celebrating 40 years of Québec diplomacy in Washington, DC with us.